We called to see where they were and were happily surprised to hear they were in the elevator, minutes away. Mr. Gore and I got into position, cameras ready, new baby sister settled nicely on display in my lap. We heard little footsteps outside, and then Gideon Michael burst through our hospital room door, his 4-year old energy lighting up the room and shattering the silence of the past two days. Following close behind was Grandmother, Granddaddy and Miss Sunday. My children clustered around me, oohing and aahing at the new baby girl, their little hands running periodically over her soft head. 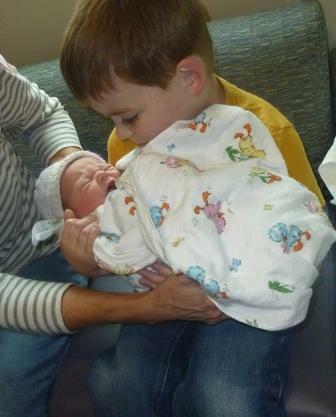 But soon it was Bubba’s turn to hold his new baby sister. We settled him onto the blue couch next to my bed and gingerly placed the tightly bundled Baby Betsie onto his lap, Grandmother’s hand inconspicuously supporting her head. All of a sudden, our class clown of a son became oblivious to the rest of us and any thought of a performance seemed to vanish from his head as he stared in wonder at this baby girl that had been hiding in his Mama’s stomach for such a very long time. He began to coo at her, gently touching her hair, her cheeks, her little bump of a nose. “Wook at her!” he whispered, absolutely and completely taken by this real-live baby doll sitting in his lap. Nothing says love like a sandwich! 🙂 So sweet!